Your personal and professional network is where the majority of your board opportunities will come from. It, therefore, pays for you to invest in building a strong network sooner rather than later on your board journey. Attending events where networking opportunities present themselves is a great way to broaden your contacts and meet people who can help you on your board journey. You don’t want to be going to the ‘opening of an envelope’ though. 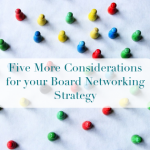 Here are five considerations to make about your board networking strategy before you register. Selecting the type of networking event to attend should align to the type(s) of board(s) you want to join. This is why it’s important to have clarity on the type of board you want to join – knowing this enables the steps on your board journey to become clear and logical. For example, if you have the ambition to join the board of a sporting organisation, you would look to attend events related to sports (particularly the type of sport that your desired sporting organisation governs). You can also attend events where the Chair or board members of this board may attend. For example, the Chair of the sporting organisation may be a Chartered Accountant in their professional career. Therefore, you may want to attend events that Chartered Accountants are attending (I’ve heard they’re actually pretty fun!). Just to note, I’m not suggesting that you stalk these people. Rather, create opportunities to meet them, introduce yourself, talk about your board ambitions, and then be on your way. 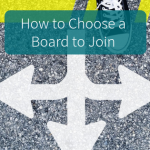 If you’re looking for help on deciding on the type of board to join, this post here will help you. Chances are you say something like “I’m just a lawyer.” Or “I do administration at XYZ company.” Or something bland like that. There’s a better way to talk about what you do. What you’re aiming for is crafting a response that welcomes the next logical question “Oh, how do you do that?” Then you’ve got a conversation started. For example, my elevator pitch is “I educate and develop new and aspiring board members.” Most times, people ask how I do that. This creates a perfect and natural moment to talk more about what I do and whether that person has board ambitions, etc. How can you change the way you talk about what you do as a profession? Building and maintaining your reputation is the best investment that you can make into your board career. 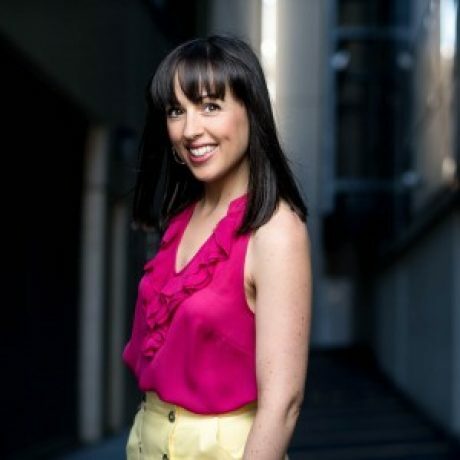 Your personal brand encompasses many factors: how you present yourself, how you talk, the work you produce in your professional career, how you treat people, your elevator pitch, your board resume, your business card, and what you do on social media. What are all of these things saying about you? Having all of these factors in alignment and reinforcing each other will create a strong reputation that supports your board ambitions. For further help with building your personal brand, this post about the importance of your personal brand, and this one about how to build your personal board brand will get you off to a good start. Having something that you can leave with people you meet at networking events helps facilitate future contact and hopefully leads to further introductions as you progress on your board goals. If you don’t have a business card through your workplace, or you want a business card that is specific to your board aspirations, I encourage you to create it yourself. There are many easy online options available and most are relatively inexpensive. Be sure to consider your personal brand, your elevator pitch, and the types of boards you’re positioning yourself for when designing your business card. If you get super stuck, just create something simple with your name, contact details (email and mobile), and your primary skill set and/or ideal board. Following up people who you meet at networking events is a great way to continue the conversation, simply say ‘it was lovely to meet you’, or – if appropriate – to enlist their help in finding a board opportunity. If you’ve directed the conversation around boards and your board goals, there is hopefully an opportunity for you to follow up that person with your board resume, and a thank you note for the wonderful conversation and their offer of assistance (of course, if they’ve given you one). Again, and I hate that I have to say this, don’t spam people with your board resume, be overly pushy or demanding, or expect them to part water on your behalf. Be reasonable and only share as much as the other person invites. You don’t want to be damaging your reputation before you’ve even started to build one. Need help crafting a resume? This post on preparing your board resume and this one on three things to consider about your board resume will help you to get started. We also provide a free five-day board resume writing challenge that you can get instant access to when you subscribe to our monthly newsletter. Like with any goal, having a well thought through plan will help to save you time, energy, money and frustration. Approaching your board goals in the same way will enable faster achievement of your board ambitions. Get started today! Share your new elevator pitch in the comments below. 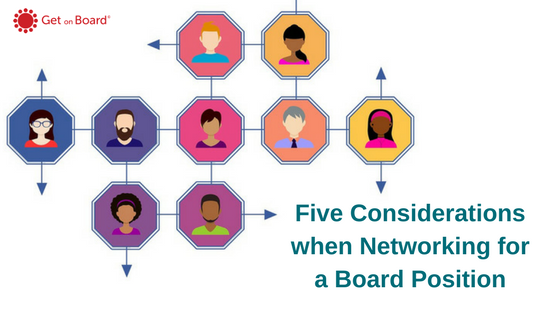 Here are five more considerations when networking for a board position. 2 responses on "Five Considerations when Networking for a Board Position"